The Moog Taurus 3 can be seen under Deadmau5's desk in this album. Adam used the Moog Taurus II on the Joshua Tree (Streets, Exit) and earlier tours (Bad). It appears he was the recipient of one of the 1000 limited edition remakes of the Moog Taurus III and will be using them on the upcoming Joshua Tree Tour in 2017.
" He started using the Moog Taurus 3 pedals this tour for what his tech calls, 'seat-rattling low end,'" states [this](http://www.premierguitar.com/articles/Rig_Rundown_Dream_Theaters_John_Myung) Premier Guitar rig rundown. 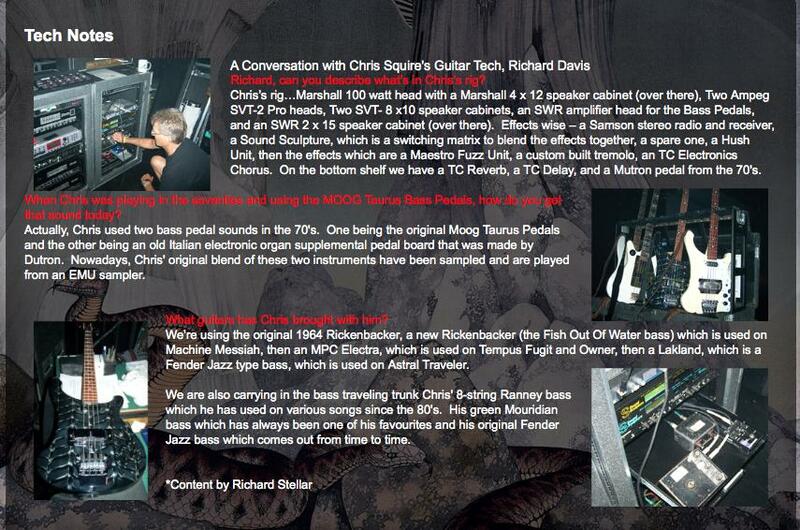 Richard Davis, Squire's guitar tech, states, "Actually, Chris used two bass pedal sounds in the 70's. One being the original Moog Taurus Pedals and the other being an old Italian electronic organ supplemental pedal board that was made by Dutron. Nowadays, Chris' original blend of these two instruments have been sampled and are played from an EMU sampler," on Squire's [website](http://www.chrissquire.com/technotes). Quote from the interview: "Gear-wise, Paz keeps it simple – a 1970 Precision that she’s been playing for 15 years, generally with an Ampeg SVT through an 8×10” and with a Taurus Moog pedal, which is used only on ‘Bag Boy’ and ‘Silver Snails’ from the new Pixies album Indie Cindy. On smaller stages, Paz uses the Mesa Boogie 15” Walkabout combo. Can be seen at 0:20 in the video. Hackett's [official site](http://www.hackettsongs.com/instrument.html) states that he uses Moog Taurus I bass pedals. In this photo one can see Geddy Lee's synth rig, with a Taurus I, which he talks about on [this page]( http://www.moogmusic.com/legacy/geddy-lee-taurus) of Moog's website. "Add some grrind to the Taurus just a bit @blackartstoneworks combo Revelation/Pharaoh combo from Hell." In this 2010 photo of Mastodon, Sanders' pedalboard can be seen including the Moog Taurus 3. "So I plug into the tuner, the tuner runs into an EHX POG II, that then goes up to my effects table where it goes into a Tonebutcher Blue Wail, then into a Dwarfcraft SOMMS oscillator. Then it goes back to the pedal board into a Digitech Whammy. That then goes into a Tym’s Guitar Big Bottom effects loop, which is used keep the low-end clean on a Fuzzrocious Oh See Demon and a Fuzzrocious Rat Tail. That goes into a Swollen Pickle fuzz, which goes into a volume pedal, which goes into an EHX Memory Toy, which goes into an AKAI Headrush II. That then feeds into a mixer back up on my effects table, which also has a Moog Taurus III…"
Lessard on the Taurus 3 bass pedals. We can see on the top of this picture a Moog Taurus 3 used by Jarre's team during "Oxygène 2007". This instrument is played by the musician Claude Samard during the show. In source from bassplayer.com Moog Taurus is part of Josh Smith Gear. The Moog Taurus 3 can be seen in this picture from Panama's Twitter. "I'm adding a Moog Taurus in now too, so I'm just learning to play bass with my left foot." Moog Taurus I it was spotted on Hans old pedal board rig setup. To really bring the bottom end, Stasik also sometimes plays his organ-style Moog Taurus 3 bass pedals. can be seen being played 50 seconds in, and near the end as well. Don't use it often but fun when I do, shakes the walls.